Well, Saturday was unpleasant. The stunning home loss to the Mavericks of Nebraska-Omaha was a cruel splash of cold water, wrenching fans from long-shot dreams of the NCAA tournament to the nightmarish possibility of a season even worse than the 2013-’14 campaign. Many are no longer looking at Marquette’s next matchup as an easy cupcake victory, but rather as a challenge with the very real possibility of a loss. A true high risk, low reward type scenario. Fortunately, Paint Touches is here to ease their fears. NJIT is a much inferior cupcake than UN-O. Comparing the two is like equating one of the chefs from Cupcake Wars to a Hostess snack pack. Marquette should be able to munch on this cupcake with relative ease. The Game Plan: The Highlanders are literally the shortest team Marquette will face all season. Their tallest player is 6-10 225…and he averages about 8 minutes per contest. Subtract their lone big from the lineup and you have several 6-5 guards and a 6-7 forward. I would say we don’t have to worry about Steve getting pushed around in the paint, but he hasn’t really shown enough rebounding prowess to make anyone confident yet. 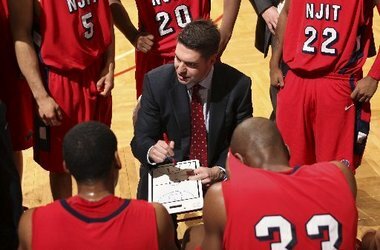 As you would expect from a team of their stature, NJIT likes to push the ball. They were top 50 in adjusted tempo last season and are top 25 so far this season. As we saw against UN-O, Marquette’s D is susceptible to a fast attack. Wojo needs to find a way to slow the game down and get his players back on defense. While NJIT may be fast like UN-O, they cannot score like UN-O can. The Highlanders are shooting an abysmal 39.4% from the field and only scoring 64 points per game despite their high tempo play. Part of this comes from their tendency to chuck up early threes. They have shot 19 more 3-Point Attmepts, than Marquette has…but have only connected on 28 of them total, compared to Marquette’s 24. The key player to stop is Damon Lynn. The 5-9 PG nailed 107 3Ps last season (3.7 per game) and has already hit 14 in his first four games. With two starters likely out with injury (Mayfield and Smith) the offense will live and die with him. While his 3P stats are daunting, his slashing and mid-range game leaves much to be desired. Lynn is a woeful 6-22 (27%) from 2P range (compared to 14-43 from 3). Marquette’s offense has looked like it is years ahead of its defense. Slow NJIT down and don’t let them take easy shots, and Marquette should win this handily. Best Case: NJIT attempts to push the ball and ends up throwing it out of bounds, off their own feet, into Juan Anderson’s hands, pretty much anywhere besides the basket. Marquette continues to force a lot of turnovers, and this time, when the press is beaten, defenders have run all the way back to deny any easy shots. Duane and Derrick work double duty on Lynn, who fires up his usual fourteen three pointers but only connects on three of them. Juan and Steve use their height effectively and each end up with double doubles due to NJIT’s vertically challenged posts. Derrick, being faced with a defender who is four inches shorter and 70 pounds lighter, uses his newly found offensive ability and ends up in double digits for the second game in a row. Deonte and JJJ shake off whatever plagued them the last two games and each end up with a respectable line. Marquette rolls the Highlanders by 25+. Worst Nightmare: UN-O the sequel. Marquette can’t slow down the game. NJIT ends up with easy look after easy look. Lynn explodes for 7 three pointers. Juan and Steve still struggle on the boards despite a huge advantage in height and size. Matt “the Bald Spot” Carlino lets more Highlanders through him than a Glasgow turnstile. The game mercifully ends with a four point Marquette victory that leaves people feeling a lot more depressed than victorious.